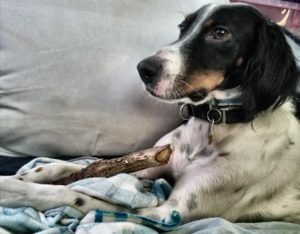 Black and White English Setter mix. Layla is 3 1/2 years old and weights 35 lbs. She is a lively friendly dog who loves to go on walks. Layla needs a home with a large fenced yard. Preferable someone at home during the day. Layla is good with cats and other dogs. Preferably a home with no young children. Owner needs to re-home due to a job situation that is requiring extensive travel.